Love him or hate him, you’ve gotta respect Eminem for the impact he’s made in the music biz. Before the artist formerly known as Slim Shady hit the scene, white rappers were largely viewed as comedy routines. This includes noted acts like Vanilla Ice and The Beastie Boys, who some might call legends. Em changed the game, and the environment he grew up in has a lot to do with his meteoric rise to the top. 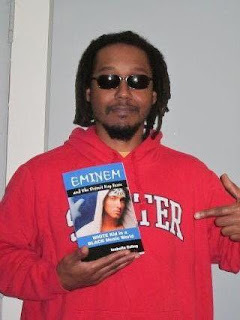 Eminem and the Detroit Rap Scene: White Kid in a Black Music World gives the reader an up close and personal look at the controversial rap superstar and the local rap scene in Detroit â€” past, present, and a glimpse at the potential future as well. This book features exclusive photos and interviews with many people who know Marshall Mathers on a personal level, including the legendary DJ Butter, Dogmatic, and the late great Big Proof, his bestfriend and the founder of Detroit’s D12. In addition to the struggle that almost saw him give up before blowing up, the author sheds light on sensitive subjects like Em’s strained relationships with Kim and his Mother, as well as the drug overdose that nearly killed him. She also drops knowledge on how he is perceived by artists on the local scene, which I found very interesting seeing that many don’t feel he has done enough to put the city on the map, despite coming back for his crew in D12 and helping Detroit talents like Obie Trice and Royce D 5’9 obtain worldwide recognition. What I enjoyed most about this book was simply witnessing how much work the author put into it. She revealed some interesting things I didn’t know about the Detroit rap game myself, and I’ve lived here all my life. It’s obvious that a lot of effort went into tracking down artists, putting these interviews together, and making sure the facts were accurate. There are several books about Mr. Mathers out there, but this one offers a perspective that is fresh, unique, and captivating from beginning to end. Want to know more about Detroit? Check out Mr. Bill Collector, a fast-paced street lit tale set in the grimey ghetto environment that is the Motor City.